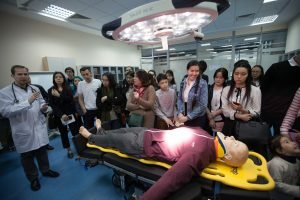 Nazarbayev University School of Medicine (NUSOM) is the only medical school in the country that is based on an M.D. curriculum that is taught in English, designed to hone your skills in both critical thinking and caring attitudes. Through rigorous curriculum which is designed in collaboration with the University of Pittsburgh School of Medicine, a major academic medical center in the United States, students are adequately prepared to take and pass the United States Medical Licensing Examination (USMLE) Steps 1 and 2. The curriculum also includes clinical clerkships which will take place in Kazakhstan's leading referral hospitals offering the best care available in the Central Asia region. Before treating actual patients, students and residents gain skills and confidence in diagnosing and treating a wide range of cases on lifelike mannequins in an authentic clinical environment. The Center has the capacity for improvised technology, computer-based simulation, task training simulation, virtual reality simulation and manikin-based simulation. The focus of the center is to promote interprofessional education and promote patient safety through simulation education. Read more about NUSOM Simulation Center. Standardized patients (SPs) are individuals trained to act and respond like real patients. SPs offer our students an opportunity to practice and demonstrate specific skills and behaviors (such as interview techniques, physical examination skills, empathy and difficult conversations) to prepare them to treat patients in the future in the safest and the most competent way. Read more about Standardized Patient Program at NUSOM.